It’s the most wonderful time of the year and London is all dressed up bringing lots of festive cheer. During this season I love seeing all the various Christmas trees across the city and this year here are 5 of my favourites, ranging from traditional to spectacular! I’ve added the location of each in case you want to go on a Christmas tree trail. This ginormous three storey tree covers the entire front facade of Annabel’s and is definitely the biggest tree I have seen out there! Looks fabulous as you walk along Berkeley Square, especially in the evening. I love the dynamic Christmas Tree on Carlos Place outside The Connaught designed by artist and Royal Academician Sir Michael Craig-Martin. 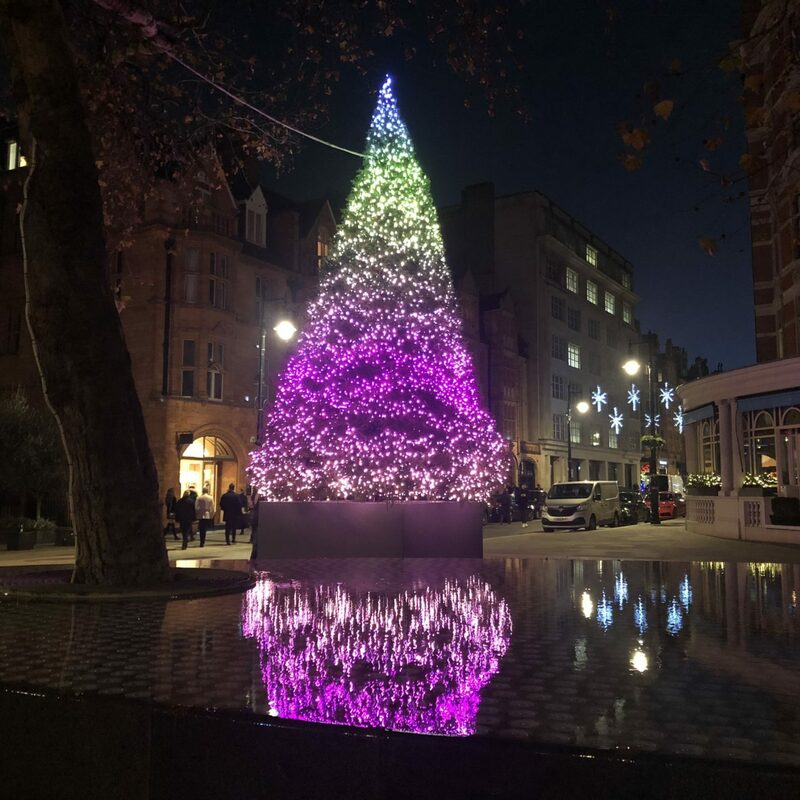 The 18-foot tall tree is a Norway Spruce, sourced in Hertfordshire, and is covered in 12,000 light bulbs, all in Craig-Martin’s distinctive bright colour palette, constantly changing. A real treat and mesmerising to see! The ‘Tree of Love’ designed by Diane von Fürstenberg “celebrates all aspects of love and life” and is a spectacular six metre tall tree glistening with 8,000 shimmering silver-leafed leaves, blue glass spheres and 150 glass hearts. In tribute to the celestial theme of the tree, the walls surrounding the tree are decorated with a custom-made wallpaper that features representations of the zodiac and constellations. This is the Christmas trees of all Christmas trees this year. The Snowscape at Aqua Shard, London’s highest Snow Globe, created by Bompas and Parr, sits in the window of Aqua Shard, resembling a modern take on the traditional Christmas tree, complete with frost covered branches but with the shape of my favourite building The Shard! It features an interactive snowstorm inside it and you can reach in and try to grab one of the golden snowflakes whirling around. If you succeed, you will be given a complimentary rum-based cocktail, served in a snow globe, and will also be entered into a draw to win a meal at Aqua Shard. 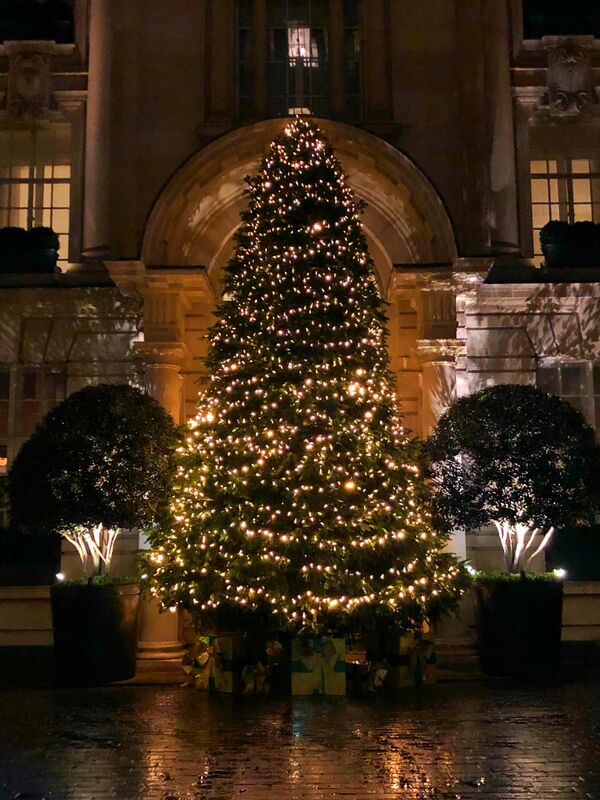 For those that love a classic and quintessential Christmas Tree, Rosewood London has a stunning tree that captures your attention as you walk in through the passageway into the courtyard. Oh what a beautiful selection! I think I like that Claridges one the best! They are all so pretty! I love the Annabel’s one, just thinking how I can do that on my house lol Do you think Mr B would notice? I absolutely love the Annabel’s Christmas tree! Lovely idea for a post!